This week I bring a review of one of my favourite makeup palettes. 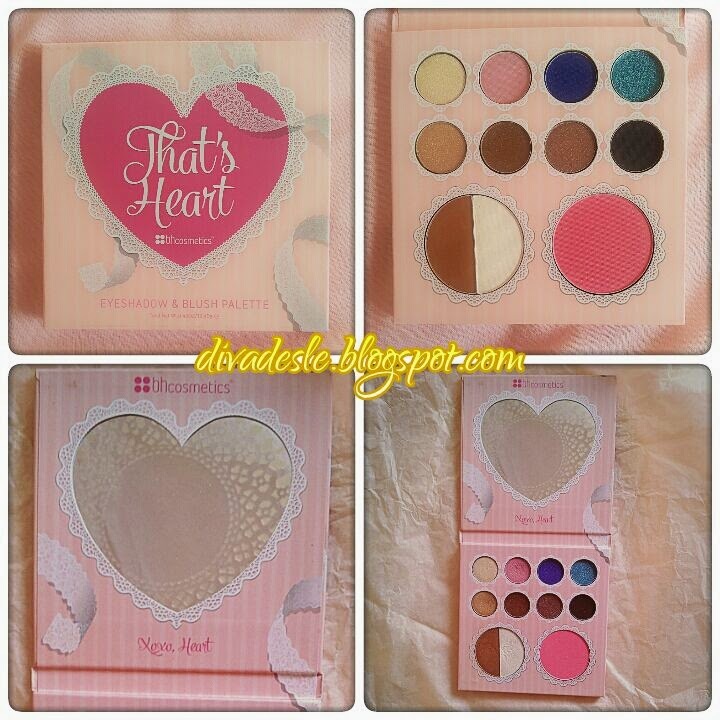 BH Cosmetics has collaborated with the very famous beauty youtuber ThatsHeart and created this pretty eyeshadow and blush palette. It is a limited edition palette which is not available in South Africa. It is currently on sale on the US BH Cosmetics website. The pink palette comes in a petite square book shape that flaps open to reveal the pretty eyeshadows on the base side and a cute little heart shape mirror on the other side. This palette is perfect for travel as it comes with 8 eyeshadows in a variety of shades, a bright pink blush and a highlight and contour/bronzing shade. I love all things pink, cute, kawaii and girly. The palette is perfect for a makeup lover and pink fanatic like myself. The 8 eyeshadows are unfortunately not named so I will refer to them according to colour. The top row consists of a glittery chunky gold shade which is perfect to layer over eyeshadow for extra sparkle. Next to it is a matte pink shade that is great for every day wear. Along side it is a deep purple eyeshadow with blue undertones. A beautiful eyeshadow for a dramatic night time look. The last shade in the row is a lovely metallic teal colour. The next row has mainly brown eyeshadows, starting with a deep gold colour which is my favourite shadow of this palette to wear on my lids. Next to it is a soft brown shade that can be worn on the lids or crease. Second to last shade is my favourite shade from this palette. It is a rose gold brown eyeshadow that blends very well and looks stunning on the eyes. This eyeshadow too can be worn on the lids or in the crease. The last eyeshadow is a dark brown colour. The larger two circled pans at the bottom consist of a bronze and highlight shade and a bright pink blusher. I love this blusher so much. It is a pretty subtle girly pink that gives just the right amount of blush to the cheeks. It is not overbearing and looks like you are naturally blushing when you wear it. This blusher is great to wear every day to work. I use the bronzing shade to contour my face as I don't need bronzing because I already have a tanned complexion. It is quite a light brown shade and can be used as an eyeshadow as well. I don't think it would work well to contour on deeper complexions as it is pretty light. The highlight shade is one of my favourites from this palette as well. I use it to highlight under my brow area and on the tops of my cheek bones. It is a white shade with a slight shimmer. It looks very natural on the skin. 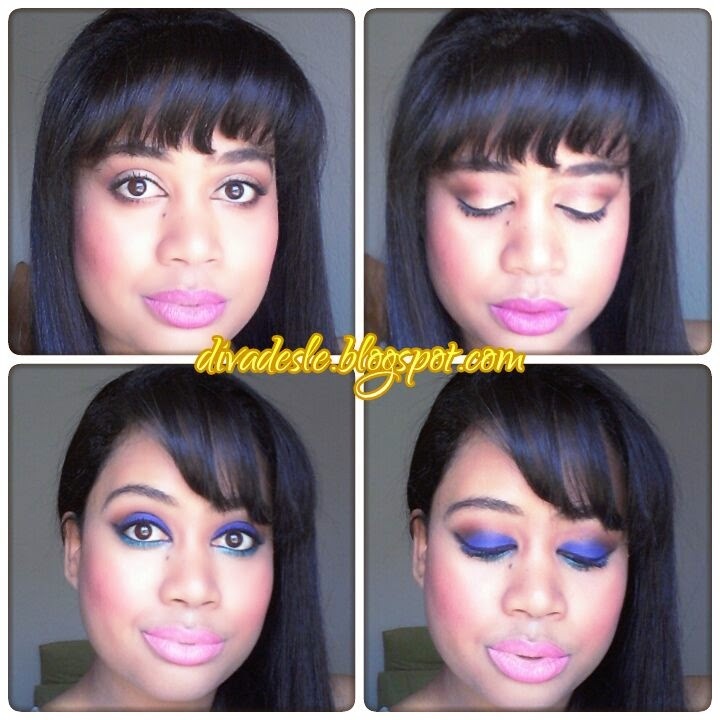 I created two looks above to show you how versatile the palette is and how great the eyeshadows work together. On the top row I used my favourite eyeshadows from the palette which is the rose gold brown shade in my crease and the deep gold shade on my lids. I paired it with the blush, highlight and bronze shade and contoured. This is a lovely every day makeup look. It is a soft, pretty and natural look and I wear it often. The bottom row is a more dramatic night time look. I used the soft brown shade and dark brown shade in my crease. I placed the deep purple/blue toned eyeshadow on my lids. I dusted the metallic teal colour under my eyes and placed the highlight under my brow bone. I used the blush on my cheeks and contoured my face with the bronze shade. It is my birthday this Saturday on the 24 January, YAY! To celebrate and spread some love and happiness I thought I would do a giveaway. I haven't done a giveaway on my blog in a while and my birthday is a perfect excuse for one. A lovely lady will win a brand new BH Cosmetics That's Heart Palette!!! Whoop!!! The palette is all wrapped up and never been opened. I am very excited to bless one of you with a pretty makeup limited edition palette. If you love makeup as much as I do then you will really enjoy this gift. 2) Comment down below with your email address or twitter handle so that I can contact you if you win. The giveaway will be open for two weeks and is open internationally. Retweeted @anitasteenkamp1, shared on facebook! Awesome Giveaway! Happy Birthday, may it only be a day filled with love and joy! Happy Birthday for Saturday! My twitter (and instagram) handle: @piecesinpink, followed on facebook too! The palette is very pretty! I don't thing we can get this brand here! I RT'd on Twitter and Shared on Facebook. Super Giveaway!! I have Retweeted @flutterbymegs :) Fingers crossed! She's a really fun blogger. That palette is gorgeous! Love that blue on you Desle. Striking! Happy Birthday! Your look you created is STUNNING Desle. LOVE LOVE LOVE !! !